One of the first Black Metal formations from New Zealand was (is) Vassafor, a band that has a limited curriculum vitae during the nineties. At the very end of last century, they broke up, but in 2004 Phil Kusabs decided to resurrect his main project. The guy, FYI, is involved with quite some other bands and projects too, but this review deals with higher aforementioned Vassafor, so I’ll stick to this one. 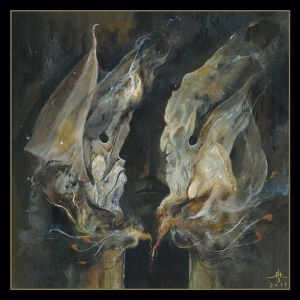 With different session drummers in the past, Vassafor recorded and released quite some demos and EP’s, some live registrations and compilations (amongst which one via their current label, Debemur Morti Productions), and one full length record. The last one dates from the very end of 2012 (Obsidian Codex, released on vinyl via Parasitic Records). In between that one and this newest piece, there were some live recordings and some splits / collaborations, some of them via the other label involved with this release, being Iron Bonehead Productions. For the split-LP with Temple Nightside, by the way, I wrote a review, which was published on June 7th 2015. So, here it is, finally, the long awaited newest full-length studio recording, recorded by Phil ‘VK’ Kusabs and session drummer Ben Parker, whom you might know from the sick-heads of Malevolence. Ben, by the way, did work with Vassafor a couple of times before. The result is fifty-four minutes assault with five lengthy compositions, which have been written, recorded, mixed and mastered by Phil himself (he does, by the way, a lot of mix and mastering work for a great number of bands). It gets released on CD (Debemur Morti Productions), the digital way (their own Bandcamp-page, as well as via Debemur Morti Productions), and on both vinyl (12”) and tape (twice via Iron Bonehead Productions). In general, the album goes on in the vein of Obsidian Codex or the splits, yet then again there is a progression going on too. The comparisons have to do with the brutality and the speed especially. When talking about the latter, one might still find that grandiose slowed-down tempo. Most of the album differs in between quite slow and mid-tempo, without being a Doom act whatsoever. A couple of times, Vassafor accelerate towards faster proportions, and that’s just fine. More than before, these up-tempo excerpts exhale a fierceness unnameable. On those moments, the drums are like a military battery, almost blasting, like a volcanic eruption. But the riffing too is, during those moments, harsh, barbaric, primal and fierce, including a thrashing rhythm section – the latter adding some sort of Teutonic warmonger. Yet, as mentioned, the better part is not that fast at all, yet at least as heavy and morbid as many colleagues from Australia, for example. The brutality from the past remains as intense and monolithic too, compared to the past. Everything sounds violent, blasphemous in intention, diabolic in expression, and that’s not just a coincidence – it’s what the band was aiming for, I’m sure. Yet then again, this time the atmosphere, to my opinion, is more right-in-your-face than before. The occult, even mystic and psychedelic ethos of the debut made room this time for a more direct approach, with an increased aggression in play and song writing. It’s more in a traditional vein, this time, yet maintaining the characteristic Morbid Death-oriented approach of old. Sound-wise, the quality is comparable to the first full length, with an unclean (and that is not a negative description) and misty, dense production, attentively for all instruments involved.